I went there with my 20-month old son on a very snowy day. 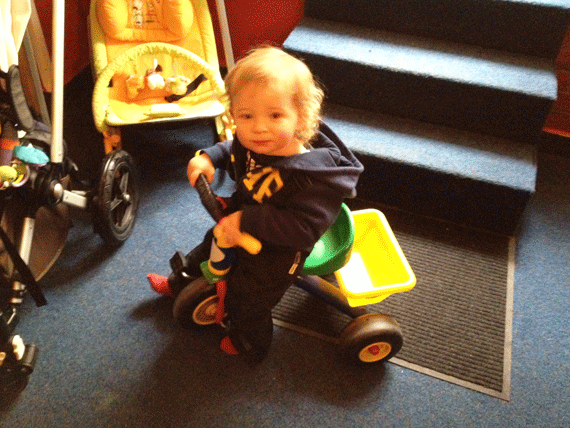 There are a few steps down to the café but the staff were quick to assist with the stroller. A warm and inviting atmosphere greeted us as we entered, the snow melting off our shoes. 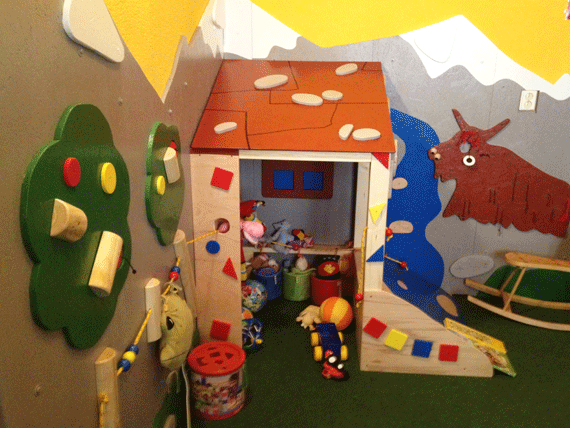 Just by the entrance is the kids’ corner, which is decorated as a Tibetan house, complete with a friendly-looking yak on the wall. It’s small, but clean and well-equipped with a decent selection of toys for babies and toddlers. There are also 2 high chairs. Close by are 2 tables for 4, so I would say that this area is good for a gathering of 3-4 parents and tots – any more and it might be crowded. At the back of the restaurant is a larger seating area where child-free adults can enjoy their meal in peace. Their brochure also mentioned that the kids’ corner is suitable for handicapped children – I couldn’t see exactly what that meant, but it seems a thoughtful and welcome sentiment, and something you don’t often see. You can stop by for a delicious Nepalese leaf tea (65czk) or (my favourite) an aromatic, sweet chai masala (45czk). 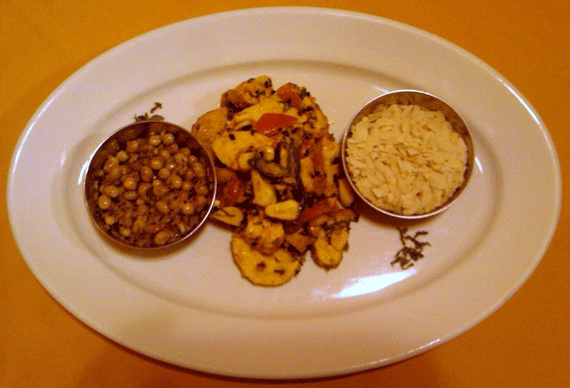 They have a big and reasonably-priced menu of Tibetan/Indian food, from snacks and starters to main course and desserts. 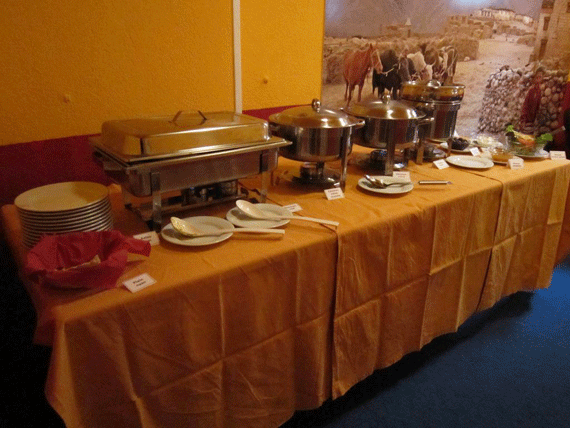 On weekdays from 11-3, they have a hot buffet with both meat and vegetarian options, for a mere 108czk. Delicious and a bargain! 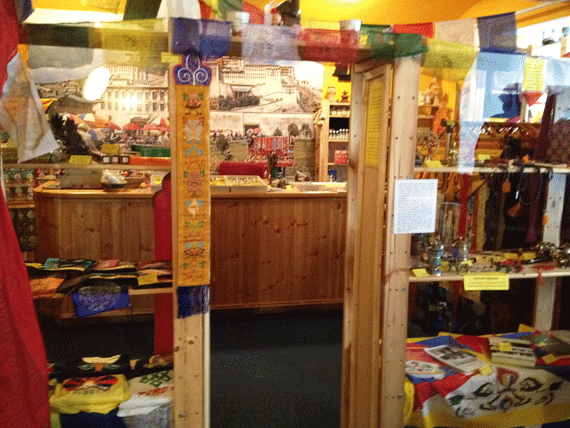 Right next to the kids’ area is a little shop selling Tibetan and Nepalese knick-knacks – just the place to pick up some incense, goji berries or browse an interesting selection of teas. The restaurant also doubles up as the local Tibetan cultural centre, and they have a number of interesting concerts, presentations and talks – worth checking out their Facebook page. The day we visited, the Nepalese ambassador was giving a speech, so there was quite a buzz about the place. Best of all, the staff are very friendly. Sagar, one of the managers, made us feel very welcome, and didn’t bat an eyelid as my son ran around the place yelling excitedly. He explained that Yak Yeti has only been opened 2 months, but seems to be doing well. Indeed, the place has a kind of “newly-opened” enthusiasm, which I hope continues as the place gains popularity. Too good to be true? Maybe, but I plan to enjoy it while it lasts. DIRECTIONS: By Metro: Take the green A line to Jiriho z Podebrad, walk to U Vodarny playground and then 1 block down Korunni Street. By Tram: Take Tram numbers 10 or 16 to Šumavska or tram number 11 to Vinohradská tržnice‎. By Car: There is paid parking around Korunni.